Our Christmas iconography is a bit irrelevant. We go to the beach, it doesn’t snow. There are no reindeer here; we have different kinds of buck. We have the sun rather than snowflakes. We wear costumes, shorts and t-shirts. We don’t need coats or coat hangers. 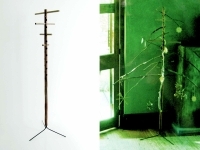 This is a coat hanger, unnecessary during Christmas, which can be used to make a Christmas tree.